There is no other recipe that has found me more friends than this one. Most of the girls who share this blog with me. ..found my personal blog by "googling Paska". The recipe originated with my husband's Grandmother .. .but I made it simpler by utilizing my blender and thin peeling my citrus. The aroma just amazing .. from the time you blend the citrus until the last loaf has cooled. You will need 4 or 5 loaf pans or you can free form little twists or use muffin tins just adjust your baking time, and watch the oven closely. In a large bowl, put your yeast, sugar and warm water. Let sit 10 minutes. Take your citrus and peel it very thin. I use a vegetable peeler. You don't want to use any of the white parts of the peel. Put the thinly sliced peel in the blender. Once you have removed and discarded the white pith of the citrus. Chop your lemon and orange, removing all the seeds. Add the chopped lemon and orange to the blender. In a microwave-safe bowl, heat the butter and milk until the butter melts or do it in a saucepan on the stove. Once it is melted add it to the blender. Start the blender .. and begin to puree. Start the blender on high and allow the citrus, peel and milk, butter mixture to run for about 2 or 3 minutes. Add the eggs, sugar, and salt. Continue to run the blender for another minute or two until very smooth. Measure the milk/citrus and sugar mixture it should be about 4 1/2 cups. If you have a bit more or less that is fine. .you will just adjust the flour likewise. Pour the mixture, along with the yeast mixture into a large bowl .. or the bowl of your kitchen machine, which has a dough hook. Add flour one cup at a time until you have a smooth soft dough it will be sticky. I think about 7 cups of flour should be right. . but it will depend on the size of your eggs and the size of your lemon and orange. With a plastic bowl, it is easy to tell when the dough has enough flour because it will stop sticking to the side of the bowl but with a metal bowl you really do need to stop the mixer often and touch your dough before adding additional flour. It really is best to stop the machine once it is getting close. . and knead the last bit of flour by hand. . .a little at a time until it is smooth. Do not add more than 7 1/2 cups flour allow it to remain sticky. If you measured the milk mixture and had 4 1/2 cups 7 cups of flour will be enough sticky but enough. The amount of flour is a guide. .if your dough is still super sticky add a little more flour a dusting at a time. Look at the picture in the collage of my dough .. .that is how it should look. It should be able to hold its shape. There will be several factors in how your dough could be different than mine, the flour you purchase or how you fill your cup of flour. (I scoop and shake to level). It could be that you have slightly more liquid. Don't despair if you think it is still too sticky, slowly add a dusting more, turn the dough on the counter and knead until you are out of flour again and then give it another dusting and continue this way until it looks silky and is elastic. (like mine in the picture). After kneading it by hand or with the machine for about 8 - 10 minutes, transfer to a large bowl, cover with plastic wrap, a tea towel and allow to rise until doubled. This should take about an hour. .to an hour and a half. At this point, give it a bit of a punch down and let rest at least 10 minutes or up to another hour. During this time prepare your pans. I spray mine with Pam. Make loaves and let rise until doubled in bulk .. .or about an hour to an hour and a half. Preheat the oven to 350 F. If you have a convection oven, set it at 325 F. Bake the loaves approximately 20 - 30 minutes depending on the size of your pans. Gently remove from pans and place on cooling racks. Once they are completely cool, put them in the freezer unless you are eating them the same day. 4 pasteurized egg whites (young children, pregnant women and people with compromised immune systems should avoid raw egg whites) I often use egg white powder and water. enough icing sugar to make a soft icing. It will harden again in the fridge. Beat all together until light and smooth....and spread on each slice .. .and sprinkle with colored sugar. So fun to think about making this once again. My family was so impressed with me last year. This year, I have my beloved to impress and I know that this will do it. yay..it is paska time.....yuppers if it wasn't for this recipe i would be without all my bloggy friends....thanks lovella! who would of thought i could be blessed like that!!!! Lovella..this Paska recipe brought us 'cooking girls' together! It's a blessing for sure!! Can hardly wait to make Paska again and as you said Lovella..the kitchen smells amazing as the paska bakes! Wow...sounds wonderful! I'll have to give this one a try, Thank you! Just keeping us on our toes Lovella. I feel like I should be baking Christmas cookies with this weather, but meanwhile the twinkles of spring are coming soon.....and we'll all be whipping up a storm of Paska. I've never seen Paska with citrus in it. My mother's recipe has 9 eggs and a tad more butter. I'll have to try this one in addition to Mom's, it looks delicious. BTW, my mom's also tended to be dry. Now I make smaller loaves and bake it for less time. You can use pasteurized shell eggs for making the icing. They're just like any other egg, but they've been treated in warm water to eliminate salmonella from the inside of the egg. You are right Lovella, it was almost exactly this time a year ago that I read your recipe on your blog and yep...this brought us all together...breaking bread together...baking bread together....grin. I just made Paska this past weekend....had to make it early as I tried a friend's mom's recipe...quite a bit different that what I was used to so I wanted to see the difference. I must say...your recipe is tops! And so like my mother's...so it must be best! 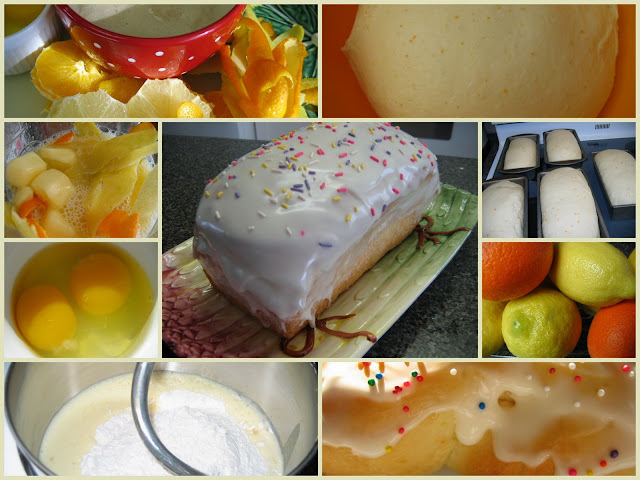 I love paska..your pictures are great and I am longing for the smell drifting through the house.This is the recipe I will be using this year...looks great. Lovella...when friends ask me what kind of paska recipe I use...I now refer them to your site. Tried your recipe for the first time last Easter and we love it! Oh! Thank you SOOOOOOO much for this recipe! I have been WAITING for someone on here to post about Paska! And I have been looking for a recipe that sounds like the one my mom makes, but doesn't require 2 dozen eggs, and a deep freeze to keep the loafs in (ie, suitable for a mennonite like me who doesn't have mennonite in-laws, and a husband who doesn't care for the stuff). I CANNOT WAIT TO TRY THIS! You have no idea how excited I am. I haven't had Paska in three years! I love this recipe, I had never heard of Paska until last year from Lovella's Blog. My boys thought I was a queen for making it, can't wait to make it again this year for our family Easter tradition! Oh it's that wonderful time of year!! I have just made Paska for the first time using your wonderfully detailed recipe. It turned out great and my family is already wanting more!! I really would like to make this bread today but i'm wondering if anyone can tell me at what point i add the yeast mixture?? I would like to try this recipe today but could anyone tell me when to add the yeast mixture?? Angela. .thank you for pointing out that ommision. I corrected it. Add the yeast into the large bowl along with the citrus and warm milk and eggs before adding flour. Let us know how it turns out . . I initially found this site searching to find what portzelky were and I'm so glad I found it! I've made several of the recipes (the maple twists are delightful!) and just had to try the paska. I am not Mennonite, but Baptist, so I have had no exposure to many of these traditional foods... but the paska is AWESOME! Such great texture and flavor. I think it would also be lovely as a braided ring for an Easter brunch. Thank you for sharing your faith and your recipes. I so enjoy this site! but I can begin this tradition in my family now with this recipe! Thanks! can't wait to try it! Ok, I did it! I made them! YUM! I kept wondering if the dough was supposed to be as sticky as it was... didn't make for kneading with my hands at the end very fun... but I didn't want to add too much more than the 8cups of flour ~ it turned out great though! Thanks! I had never heard of Paska before but when I saw the picture I knew my husband would love it.... and boy did he as did my father! All the loaves were gone in 2 days and they are begging for me to make more. I love the fact that is was really so easy to make. My best friend Jen made this recipe last week and it was so delicious, better than any i've ever had (sorry to my mother-in-law). Now that I have an orange, I am going to give it a try. I made 2 big loaves, 3 mini loaves and a dozen muffin sized rolls with the paska dough - they turned out great! I kept the dough on the moist side and the bread is moist, rose very high and tastes great. My 10 year old daughter says, "it tastes like spring!" I agree wholeheartedly! Thank you for this lovely recipe. Lovella - Jen here, again! A non-Mennonite Friend and I (non-mennonite) are wondering if Paska has any "meaning" behind it for being such a special bread at Easter... is there a story? Do you know? Just wanted to vouch for this recipe too. I finally made it this afternoon, and SUCCESS! It smells so wonderful, and even my picky sis-in-law liked it (she hates orange peel in things). I am not an accomplished baker by any means, and I was nervous to attempt something like this, but it worked out so perfectly. I posted some photos on my blog too. Thanks so much for this recipe, as I was convinced I would be without Paska once again this year. I have been baking paska for years but thought I would try this recipe. Everything went well and the paska baked well. However when cut the paska even though the paska looked done it was quite soggy and heavy. Dear Baffled. Oh I am so sorry that your paska was heavy and soggy. That is certainly not how it should be, should it? I wonder if you maybe the oven was a touch hot, creating the illusion that the paska was browned therefore baked through. Otherwise, I have no idea. .I made it again today. .and it is light as a feather .. I am so sorry. I am loving your website and all of your beautiful recipes! I am very excited to try the Paska recipe but I am wondering if you can freeze half of the dough? Thank you and happy spring! I actually have never tried freezing the dough .. .I would perhaps try to form into loaves or small buns on a cookie sheet after their first rise, freeze them and then put them in plastic bags to be kept frozen. . then take them out and put them in pans or cookie sheets to allow them to rise. I thought it was about time to comment as I have been reading your blog for 2 years now; I too came across it while searching for a mennonite paska recipe and have been reading it ever since. Today I am making this paska once again as it has turned out to be very yummy the last two years that I have made it. Thank you so much for this delicious recipe. I have emailed you before, but I have never left a comment before. Thanks again. My Paska is rising and all is right with the world... Yes, seven cups or very nearly that was what I used...on my recipe you apologized for not measuring so I just started with five and worked my way up. I can hardly wait to have some of this tonight! I have always wondered why I couldn't get the icing the way my Mennonite Mother-in-law made it, my husband was never happy with it always said wasn't like his Mom's, well thanks Lovella when I read your recipe I said that is it she used the white of an egg with the icing sugar makes all the difference so thank you success at a last. Oh . .I know about the icing. . it is so yummy, no other icing is good enough for my family too. I had one other gal email me telling me that she was unable to print recipes .. . but I just printed one out and it worked fine. . it might be your settings. . sorry I am not that computer savvy to be of much help. Try to copy and paste onto word and print it that way. That is the best I can offer. I have never made paska before and I made this today and followed the directions and it looked done after 22 minutes.The loafs were nice and high but seemed to fall as it was cooling. The icing seemed to separate also. It tastes great though and I am wondering if the doe was too sticky and maybe it wasn't totally done? Your thoughts? Ah .. so sorry your loaves fell .. probably the your oven browned them sooner and they should have stayed in the oven a bit longer. .that has happened to me as well, if my loaves were bigger. . and the icing? I'm not sure. . that hasn't happened to me. .maybe you just needed more icing sugar .. I'm sorry. I was raised on Paska every Easter but have never attempted making my own. With this great recipe I may have to attempt it this year! Paska (or Pascha in Greek) means Resurrection. I thought someone might appreciate that tidbit of information. :) I grew up having (and loving) this stuff in my Mennonite background family's Easter tradition. When I became an Orthodox Christian, I discovered that all the Russians and Ukrainians do this as well! (Although most of the time the Orthodox Pascha (or Easter) is at a different time than the "West", kind of like Ukrainian Christmas is different. I guess the Mennonites have a lot of Ukrainian and Russian influence though. :) ) Thanks so much for the recipe as I love to try different ones! Could you please tell me approx. how much icing sugar you use for the icing? Looking forward to making Paska! thank you. About the icing sugar amount .. . I would say maybe about 1 1/2 pounds. . but really. . you need to make it a soft icing and remember that it will harden in the refrigerator becuase the butter will harden. Next time . .I'll measure. .just for you! Quick question...Do you have a standard oven, or do you have a convection oven? About the OVEN... I do have a electric oven with a convection option. I do often use it for bread baking and it cuts down on the baking time and then I usually bake it a bit slower .. like 325. I have used this same recipe for 30 years before I had a convection. Every oven is different and often times ovens are off on their temperature settings. Question: When you measure out your flour, do you SCOOP it with the measuring cup, or do it the proper way--pile it softly into the cup and level it?? Well, because of my history with making paska :P, I thot I'd do it the 'proper' way and I really had to exercise constraint not to add more than 7 1/2 cups. So, it WAS sticky! But I had to spoon it into the pans--3 only half full. Of course they rose! But to look like a gramma's saggy tummy! Oh my!! What to do?? Bake 'em!! If they are inedible--Through NO FAULT of the lovely recipe blogger!! !--I shall use it like the loaves in my freezer from last year....I feed them to the chickens who later lay Easter Eggs!! Fear not! I SHALL try again! I mean it works for SO many others! Barring that--Do you ever sell your paska????? Well! A follow-up...to the post about my paska misadventures....My paska is done!! It looks hilarious! But it tastes HEAVENLY!!! Thankyou so much for posting this recipe. My mother in law made the best paska I ever had but since she died 9 years ago and no-one had the recipe so I had no clue what the ingredients were. I knew she had used lemons and oranges and when I tried this recipe it was exactly what her's tasted like. So thank you so much. I love to make small loaves and give them as gifts. My mother in law made the best Paska I had ever had but when she passed away it was like that recipe died with her because no-one had the recipe. She always just baked from the top of her head, with out recipes. So I was looking through these recipes and I found this recipe and it sounded so much like hers because of the oranges and lemons so I tried it and, oh my word, it was exactly like her's. So thank you so much. Could one go through your steps to the milk/citrus and sugar mix stage then instead of using a mixer pour the mixture into a bread machine and add the flour and set the breadmaker to the "dough cycle", letting the machine mix and initially rise the dough? Then one would remove the dough, punch it down and set in pans and continue as you direct? I cannot knead anymore and my bread machine allows me to still enjoy home made bread. Update... I made this recipe 2 days ago and turned out perfectly!! It is THE most delicious Paska I have ever had. I think I'm allowed to say that because it's not my recipe! :) I have shared with family and friends and they love it too! Thanks so much for sharing your recipe and giving such a detailed account of directions. I was wondering if someone could help me in halfing this recipe? I dont think I could eat 4-5 loaves and I am worried my family wont like it. Is it possible to half it? for Sharon: If your bread machine is large, this should work just fine on your dough setting. the bread machine yeast does not need to be proofed, so just put everything into your machine and start the dough cycle. Check it several times to make sure it's not too wet or too dry. You may need to reduce the amounts if your machine can't handle this much dough. Such good paska!! We enjoyed ours last night - I said it tasted like cake! I formed little buns close together in a spring form pan and they rose so high that it looked like a big bumpy cake in the end. I sliced through it (horizontally) like you would for a cake. Spread it with icing and then put some on top with sprinkles. I know this will go over well for our kids, who always want extra icing. I have a hard time remembering to count cups of flour, but I mixed twice and came to the conclusion that if you measure your liquids, your flour would be times 1.5 (eg. 4 cups liquids, 6 cups flour)I use unbleached flour. It is tempting to take them out of the oven once they look slightly brown, but try to keep baking them at 325F at least another 5 - 10 min. to be sure they are done and don't end up falling. Extra small loaves, may be a good start for beginners. For the icing I used about 4-5 cups confectioners sugar or 1-1/4 cups per 1/4 cup butter and each egg white. It turns out better if you beat the egg whites first and then add the sugar and soft (not melted)butter. On sprinkles - there are two kinds - the hard round ones and the little stick like ones that tend to be softer - not crunchy. You have a choice there too. Thank you Lovella, for not only freely sharing this recipe, but trying hard to help make it a success for all. Thank you Lovella for making the instructions so clear and easy for us no so advanced cooks! I really appreciate the time you have put into that and for sharing it with us! Made it for the first time yesterday and it is tasty. Unfortunately, I don't think I baked it long enough :-( But we are still going to enjoy it! Just curious about the icing - can you freeze iced or is it best to ice them after they come out of the freezer? you can certainly put the icing on and freeze. The icing doesn't go bad in the freezer. My family likes icing on every slice so I generally freeze the loaves bare and then ice each slice. For company .. I put icing over the whole loaf. If you do put icing on and then freeze ..I usually set it in the freezer unwrapped for about half an hour so the icing sets. .and then wrap and freeze. I come from a Mennonite background, grew up in a Mennonite town, currently live in a different Mennonite town - we all know Paska! However, this is the BEST paska ever!! I made the recipe the other day and all 5 loaves were gone by the end of the day! I did give away 3 and we ate 2 (there are 7 of us!). My neighbor "hired" me to make more for her gatherings this weekend after tasting the one I shared. I sent one to the church leadership meeting my husband attended the other day and they confirmed it was scrumptious! I currently have another batch rising and plan to make more tomorrow! Thanks SO much for sharing! Hello Mennonite Ladies, I'm thrilled to have found your blog and am so happy to see that Mennonite recipes are not being forgotten. I will share my recipe for Paska Cheese Spread which uses quark from Foothills Creamery in Alberta - a very unique, tangy flavour:16 oz. quark, 1/2 c. butter, 1 c. icing sugar, 3 hard boiled egg yolks, 1 tsp.vanilla, 1 tsp. lemon juice. Combine everything until smooth. Enjoy and Happy Easter! P.S. Famous Foods sells this delicious quark. I read about your blog in the Vancouver Sun or Province a couple weeks ago and had to check out your Easter bread recipe right away. Well, I made it today and it's wonderful but I did bake for only 20 minutes and could probably used another few. It looked beautiful and golden on top but slightly underdone on the bottom. Wow. Baked it. Love it. Huge hit with the family. And the icing is great too. Yum! Thanks! Thank-you Lovella for sharing this wonderful recipe! Today was the day and it turned out wonderful. I tweaked it a bit by using bread flour, adding 2 extra egg yolks (to color the bread a bit more), a 1-1/2 tsp of Fiori di Sicila flavoring (Italian, citrus-vanilla) and an egg-white wash topped with Swedish pearl sugar. My parents are icing fans, but I will be eating it!!! When I use my Bosch machine, my paska does not seem as light. Is there something I should chang? Am I beating the eggs and sugar too long? this bread brings back memories upon memories. my gramma used to make the loaves in small coffee cans so each of us kids could have our own every year! My husband's family were able to enjoy this amazing bread with us this Easter. The result was a bread that was very moist, light and with just a hint of sweetness; the cream cheese icing that I made to go with it topped it all off wonderfully! Yes, it's New Year's Day and I'm reading the recipe and all the comments all because I am fine tuning my recipe collection. To the many queries about this, that or the other if you make any other yeast breads and use a slightly different method use them for the Paska as well. The one thing that was drummed into me as a Mennonite girl was that the dough had to be really soft, softer than most other doughs, but still dough and not a batter. Altitudes, dryness of surroundings, etc all effect the moisture content of flour. As a result the flour amounts may vary substantially. Another factor is whether you fluff, stir, spoon or level the flour so if you can develop a feel for dough that is the best indicator. I love the icing as a spread. I will be using this recipe shortly, adding raisins, perhaps mixed fruits and have fruit bread. Though I look to some traditions I am a very untraditional girl. Comment on Mennonite traditions--many differences show up up based on the era of immigration and the original colony areas, if via Russia. I knew some of that from the great differences from our home to those of some of my aunts and uncles. I really didn't understand the reason until I researched history to get a better understanding of my ancestors lives. I just made this recipe today for the first time. It was sooo worth the extra effort of peeling and then blending the mixture first. I made half the dough into mini buns and the other half made two smaller sized loaves. Next time I might do them all into small buns. The finished product is a delicously soft citrusy bun that is absolutly yummy! I couldn't keep something so good just to myself, so I brought a plate full over to my neighbor who recently had surgery. Thanks for another great recipe! I can't wait to try making this for Easter this year. Thank you for sharing your treasured family recipes! Where did you find egg white powder? I would like to share a loaf with a family who has some health issues, to give them a "taste of spring" as was said before, but raw egg whites would not go over very well. I can't wait to try this recipe in time for Easter. Thank you for sharing your treasured family recipes with us! Where did you find egg white powder? Is it the same as meringue powder? I would like to give a loaf to a neighbour who has some health issues within their household, and don't want to risk using raw egg whites. Thank you! Teona. .yes you can use meringue powder in the icing. Just getting ready to make this recipe for the first time...One thing I'm finding...we live in the Bahamas now (for work not vacation!) and the humidity is a factor in all of my yeast baking...Must adjust the flour accordingly and I don't know how to tell someone else to do that...I do it by feel!!! Also I'm smelling my hot cross buns as they bake right now...no little dough crosses for me...I'm too impatient! LOL!!! I've been enjoying your site for several years now and have a recipe for Paska Spread that I've used for years. It's a smaller recipe than is on the site and we really like it. From Altona Womens Institute - Canadian Mennonite Cookbook. Paska Cheese Spread..
a little sweet cream may be added. Store in sealable container in the refrigerator. Enjoy!! Made my Paska today...the easiest, most delicious Paska ever!!! Humidity was high today so actually had to use 8 cups of flour...still have very light and delicious Paska! Thanks so much girls! And Blessed Easter everyone!!! I made 4 loaves of this Paska today and they turned out perfect! I am having trouble with the icing though... I need a "method" since mixing the butter with the egg whites was a disaster! Even tried whipping the eggs the second time arounf. HELP!!! Annoymus. ..about the icing. I just put the egg whites and butter and about 2 cups of icing sugar in a mixer and turn on with beaters . .go slow at first. .add more icing sugar and whip until light. Tried out this Paska recipe this past weekend - and it was wonderful. I don't have much yeast-baking experience, so I'm always a little worried. But all turned out well. Thank you so much for sharing! Reminds me of all those Church Basement Sunday morning Easter sunrise breakfasts. Mmmmmm! When I saw this recipe posted, I thought I would give it a whirl even though I had never made it before. My mother used to make wonderful paska and my memories kicked in of her taking these wonderful light breads out of the oven and placing them on PILLOWS (can you imagine?) to cool so they would not collapse. Now when I made these, I did not use pillows but my sister-in-law who has made this recipe, suggested a white fluffy towel. that did the trick. My mother died last year and baking paska was a wonderful reminder of her. thank you for the inspiration. In the icing directions, should it say spread icing on each slice? Or on each loaf? I love this recipe! I love this recipe and will make it again this year, it's better than Omas'was. My daughter needs Gluten free, has anyone tried that. Lovella - your recipe really IS famous you know!!! I don't know if this is the recipe that led me to your MGCC blog but it sure is one of my most favourite - it's becoming our Swiss Mennonite family's tradition now too. Lovella - your Paska recipe is famous for sure! I made it for the first time last Easter and think it just might become a "Swiss Mennonite" tradition in our home! I am forever thankful that I've found your MGCC blog site. It has greatly enriched my life and taught me so much. Cannot wait to make this again this year! My mouth is watering at the memory of it! You can also mix sultana raisins in the dough or any other nuts. Mix sultana raisins with little flour so they won't stick to the bottom.Paska icing: I mix whipping cream and icing sugar together, vanila that's it. This recipe sounds very yummy!!! Thanks Lovella!!! I have never made bread before...could I shape these into buns? and how long would I cook them for? Thanks so much for this WONDERFUL recipe site!!! Twyla, Yes..you most certainly can shape this dough into buns. I would bake them about 15 -20 minutes...or until lightly browned. As always...it depends on your oven and how big you make your buns and even on the kind of pan you use. I am making your paska recipe for the fourth year in a row and it is rising as we speak :) I enjoy it fresh that same day and I have had success with baking half of the recipe and taking the other half of the dough & refrigerating the loaf pans full of dough before the second rise, then I let them rise for about a half hour the next day after taking them out of the fridge and they bake up nicely... that way we get fresh paska two days in a row :)Making this every year is a tradition that has been passed down through the generations that I am happy to continue :) Thanks for the great recipe! Had kitchen renovation issues this year that delayed my baking until yesterday afternoon and today!!! The Paska is absolutely the best...even in a new oven!!! I made buns in muffin tins and then 3 loaves in old lard pans from my mom....smaller than regular loaf pans!!! Just awesome! How was your Easter celebration? Mine was TERRIFIC due to your FABULOUS paska recipe...I did make the dough into buns and they turned out GREAT!!! One thing to note is that on the website it tells you how much yeast, sugar and warm water to use, but when I went to print it out using the print friendly, the yeast mixture does not print with the recipe. Just thought I would let you know. Thanks again! Made your Paska last week - my first time as an adult and I loved the lightness of the recipe. As I shared my Paska with extended family I was surprised how many people have negative memories of Paska because it was dry and dense. This recipe seems to capture the traditional flavor, but improve the texture. Thanks SO much for sharing it!! Can I use fast rising yeast for this recipe? You can use fast rising yeast with this recipe but I would mix it with the flour as instructed on the package. Hi Lovella, just wondering if you think it would work to bake this recipe with sprouted Khorasan Wheat flour? This is one yeast dough recipe that I have never tried with any flour but white. If you try it I would love to hear from you how it turned out. After some research on Khorasan Wheat (and a whole batch of regular buns made with it that didn't turn out so awesome - dough rose but ended up with flat buns!) I'm back to let you know that regular white flour is the winner for Paska...I'm not going to mess with it! Khorasan Wheat is lower in gluten than regular wheat flour, and the gluten breaks down faster too so it's not good for yeast recipes that require significant mixing and rising. It IS a good substitute for cookies/brownies/muffins, etc. though. Hi! My question is: do you have the dough rise at room temperature? I've heard of people having their dough rise in a warm oven (like 150 degrees). What do you suggest? I'll answer for Lovella here. I do think that 150 degrees is too hot for a proper rise. It might rise quickly and fall. I would not go higher than 100 degrees. The best thing is to leave it in a large bowl,at room temperature (about 70 F) in a draft free place, cover it with a tea towel and plastic over top. The humidity created in the bowl with that is good. I have made it in a hot climate where the romm temp is about 90 F and you just have to plan on it risisng faster and not let it rise too long. Looking forward to trying this Paska recipe for the first time, especially after all these rave reviews! One question...I don't have a normal blender, but do have an immersion blender. Would that work or has anyone tried it that way? Nevermind...I tried it yesterday afternoon and it worked! Paska turned out beautiful and is so delicious! Thanks for this awesome recipe. I haven't had Paska in years. My Grandma would use empty tin cans to make them in. They looked like mushrooms. I will make this for my grandchildren. Thanks for the recipe. Somebody mentioned that your Grandma added Instant Vanilla Pudding. At what point do you add it. This is an awesome recipe. It turns out real moist and has a nice orangey flavour. I will be making this again. The only thing I did different is I added a cup of golden raisins. Thank you girls keep up the good work. Never made paska before but have tried making buns recently which turned out great so I figured I could try. Just got home and it has risen to the point of almost overflowing the bowl! A good sign, right? Used fast acting yeast just in the flour so wasn't sure. Think I'm going to do bun form instead of bread. My kids like the paska/icing racio better. I made mine today, it turned out wonderful! I can't wait to bring it to my parents in law tomorrow. My paska is rising right now. I've made your recipe for the last 4-5 years. So good. Just curious though - the one I printed up from ages ago has a box of vanilla pudding mix in it. I see it's not on this recipe now. (Did I somehow add that myself!?) Just wondering! Thanks for all the yumminess over the years! Hello Lovella - I am sure I asked this question a couple of years ago around Easter (we are Ukrainian so similar celebration bread for Easter) - I don't have a blender, however I do have a trusty Robot Coup (like Cuisinart) food processor approx 8 cup capacity. Do you think I could make this recipe in the food processor instead of blender? Hi Margo, You can blend all the liquid ingredients in the food processor but I think I would add a bit less of the liquid to the citrus peels. The food processor bowl seems to lose liquid easier down the center post. Otherwise.. I would add the flour and knead by hand. The whole recipe would be too big to finish in the processor. Convection ovens work well for yeast breads. Bake 25 degrees less than conventional. Baking in a circular pan would work just fine. Hello Lovella - one more question - about WHICH YEAST --- i went to the IGA supermarket and they have the Fleischmann's product line - which one do I buy? Margo, use 2 tablespoons traditional yeast, not instant yeast. Open all the envelopes and measure it out. Hello Lovella - well, I have the yeast (my previous question) - all nice and fresh from the market - now i have one more question - because - i had no idea that the supermarket would have so many different flour options 'til I was bewildered by the display at our IGA - let's go with Robin Hood (because I know that brand here in BC, Canada) - now what? Do I use the unbleached, all-purpose white flour - the type i'd use if i was making cookies or pastry? Or do I need to use the "bread" flour? ALSO - are the sprinkles on the icing - is that traditional? I read thru the comments here - and not sure about that. - I hope you're enjoying your early signs of spring out there in the Valley. Margo. Please let me know which type of Brit Columbia flour to buy for this recipe - there are so many Robin Hoods in our local IGA Marketplace here in Coastal BC. Do I specifically need to buy BREAD flour (some say bread machine - I am doing this by hand - I don't even own a stand mixer) ------- or can I use the simple old-fashioned (now ; ) ----- all purp white flour - by Robin Hood brand. Thank you in advance - and happy daffodils out there in Bradner. Margo. I am not fussy about what kind of flour I buy here in BC. I have bought unbleached flour or have often just bought the kind on sale. As long as it is not whole wheat or any of those variations or cake and pastry flour you should be fine. I often buy all purpose white flour by Robin Hood so that would be a great choice for you too. thank you and what a spring day in beautiful BC. A rebirth. I noticed they even have a 'robin hood' brand "BLENDING FLOUR" ------- what is that for? I am visiting your site and this recipe after I saw an article on Easter Bread with a link in my local paper. I think this is the closest I have come to finding my grandmother's recipe for paska ever! I am very excited to try it! She used to make hers in a vertical round pan -- I even think I remember her using a coffee can, so the bread looked a bit like a mushroom. Is this doable with your recipe? I'm so happy for you to have found this recipe which will bring sweet memories to your kitchen of your grandmother. You can certainly use a coffee can as long as it does not have the white lining inside the can that many cans have now. I have found some cake pans that are similar in shape that will give the mushroom shape you are remembering. Sooooo.....You don't recommend instant yeast...? Can you just add the yeast to the flour and then make sure the proper amounts of liquid are in the mix? Hmmmm? All I have is Baki-pan Fast-rising Instant yeast.... Guess I should wait, eh? till I get some other yeast? Hi Becky, Sorry.. by now you have gone to get yeast. I use the yeast at Costco that is probably somewhat in between instant and regular. It is fairly fine granulated. I think instant would be okay. I just never buy instant. but if you do, just add it to the flour like you normally do. Hi! I was just wondering if you made the small paskas on the photo in muffin tins? Thanks! Yes, in mini muffin tins. Would you recommend icing the bread prior to freezing it or would it be best to freeze, thaw when needed and then ice? I have made it just one day in advance so I will be pulling it from the freezer less than 24 hours after it's been baked. Also, I am pregnant and therefore would like to avoid the raw egg whites in the icing. Do you have an icing recipe alternative? thanks! Just finished my second batch of this year's Paska. I apprenticed with my grandma many years ago to learn how to make a good Paska. One trick she taught me was to just chop up the lemons and oranges and puree them until fine in the food processor. It takes away some of the work. BTW - I made my first batch last week with old yeast and I shouldn't have. This week's batch with a new jar of yeast is completely different and heavenly. Good advice about always using fresh - I am writing that in my recipe! Happy Easter - Tina. Hi Lovella! Its my firt time making Paska!! I used meringue powder instead of egg whites, the icing is nice soft, but seems a bit fluffy. Not shiny and smooth like your picture. Could it be the meringue powder? it looks like you could pour your icing on, or is the texture supposed to be thicker like a soft cream cheese spread? Can't wait til it comes out of the oven!! The smooth shiny icing is just for decorating. We spread the real icing on each slice. The decorating icing is simply icing sugar, milk and a bit of corn syrup to make it the right consistency. Can I make these like normal buns or do they have to bake in muffin tins as you stated? Sorry this is so late Karen. By now you have made your Paska. They can easily be made into buns as I'm sure you have found out. I actually was ill and never did make them for easter.I was so thriller when my nephews wife waked in to our gathering with three trays of them(as buns).I promtly asked her what recipe she used.YOURS!lol!I laughed.so I got to eat them without the work!Awesome recipe,the whole family loved them. This was the second time I made this paska recipe. This year was better than last because I blended both the whole orange AND lemon in my vitamix. Plus I let it rise three times. And I kneaded it for twenty minutes in my kitchen aid. I also coated each leave with margarine by spreading it on my hands as I formed the muffin buns (I used the muffin tin to assist with dividing to share with neighbours). These are great tips. I know the readers that are going to make it will appreciate them. thanks. I have made this twice now with good results, but I'm wondering if it's possible to half this recipe. I'm only Mennonite By Association, so I don't have as many people to feed it to who appreciate it for what it is. I didn't want to mess with the proportions so I made the whole recipe but it's way too much for my family. What say you about that? Hi Rachel, I think it would be fine to cut the recipe back by half. It is actually very forgiving dough. I'm glad it has been turning out well for you. If I use fermipan yeast, would you use the same amount? Yes, I use the same amount if I use Fermipan Yeast. Enjoy! I have a quick question for you. If I wanted to make this recipe into buns instead of loaves, is that possible? If so, would I just roll the dough into balls and put them onto a cookie sheet to bake? I've never made any sort of bread before so I'm a little nervous. Hi Katie, yes, making the dough into buns would work just fine. Just remember they will more than double in size so leave room for rising so they are just touching once baked. Grease your cookie sheet or put parchment paper down. If you have muffin tins, that works really well too. Almost any shaped pan will work. Just wondering where you get the colored cups that your buns are in? Do you use them just as a decoration? Hi Sharon, I do bake the Paska's in those little cardstock cups. It works great and so easy to transport. I bought mine at Homesense. Hi Rachel, I'm sorry your comment and question about the cardboard baking pans disappeared. I use either soft butter or oil would work fine too for forming my buns. I like your idea of the FAQ post and will put a note to myself to do that next March when everyone is back to making Paska for Easter again! My paska turned out beautifully and delicious!! Kindly, I see a lot of Mennonites referring to paska as "Mennonite Easter bread"--this is not quite correct. Paska originated with the Ukrainians/Russians. Yes, Mennonites happened to live in that region of the world, where this bread was appropriated. Maybe a post on the politics of cultural appropriation and food would be good at some point. My understanding is that Mennonites are Dutch in ethnic origin, thus, it is only polite to give credit to the actual people who invented this bread--which was not the Mennonites but the Ukrainians/Russians. that their language was shaped by the Dutch, when they occupied/colonized Indonesia in the 18th century. We have found that there is a small difference in the Mennonite and Ukrainian Paska in that the Ukranian Paska uses a spread made with eggs and farmers cheese. In essence we have different recipes, however both are sweet breads with the same name. We have both versions on the blog. Hopefully this helps explain our relation to Ukrainian/Russian foods in a respectful manner. Thank you, this is a respectful reply. Just a reminder, Canada is not just 150 years old, the Indigenous of Canada inhabited this land for at least 4,000 years. So, Mennonites are not indigenous to Eastern Europe any more than white people are indigenous to Canada. Living in one place for 150 years is not a very long time when compared to indigenous peoples who inhabit those areas. Thank you for understanding the importance of talking about culture and its origins respectfully. Food is a very passionate and emotional expression of culture. Every year I make Paska and every year when I get to the bottom of the page and it says to bake loaves for 20 minutes, I'm floored. I use the little foil loaf pans you buy at the grocery store and my loaves usually take close to an hour! 20 minutes has got to be a typo! Have you tested your oven temperature lately? Foil pans generally do take longer to bake and maybe you prefer your baked goods browner than I prefer mine. I use USA baking pans. The main thing is that you are baking Paska and have found out what works in your oven. How do I make this for one loaf? Melissa, it would be a simple matter to cut the recipe in half. That would make two loaves. I can guarantee you will not be sorry to have more than one loaf! Enjoy. Sorry that I’m so late to respond. I generally fill the little card stock cups about 1/2 to 2/3 full. Once baked, give them a couple of minutes to cool and then loosen them. I love this recipe! It is my go-to Paska recipe for the past 5 years or so. Before that I used my mothers. I make several batches, wrap them up in pretty celophane with pastel ribbon, and on Easter weekend give them to neighbours, co-workers, friends and family, and of course serve at our Church coffee time. So delicious! Am I able to put the dough in the fridge overnight and then bake in the afternoon the next day? I’m sorry that I dhave not know. I’ve often wondered that. It would likely work to a certain degree but might not rise quite as light during baking.